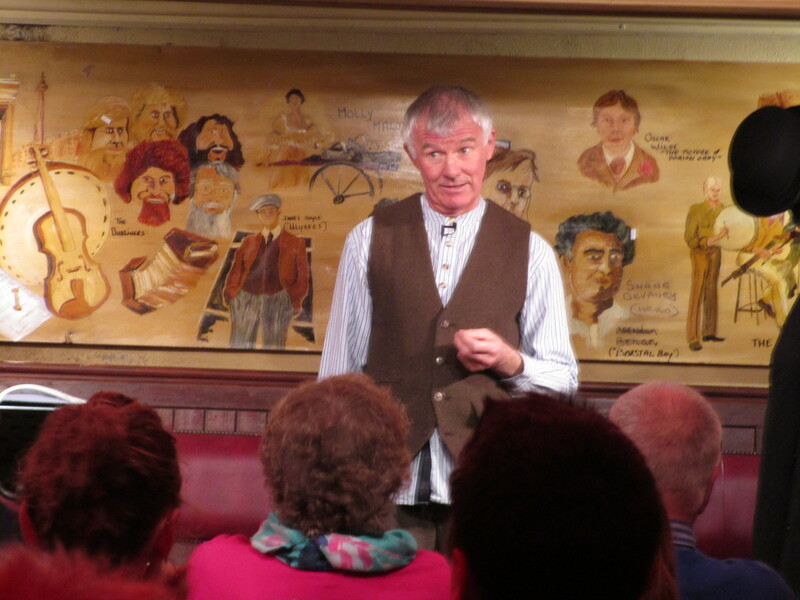 Robert Gogan’s one-man show, “Strolling through Ulysses” (ongoing at The Stag’s Head pub and other venues, Dublin) is ideal for anyone from the James Joyce scholar to the intrepid reader who found the work impenetrable. The former will be engaged by how Gogan highlights certain layers – especially the potentially humorous ones – of that manifold work, and the latter will be delighted to find a perfectly accessible presentation of Ulysses as a piece of entertainment. Even those who have never tried the tome will have no trouble following the plot and pleasures of Gogan’s show. Mainly, for those of us who read the novel with a mixture of admiration and frustration, Gogan brings back the good memories without triggering the bad. Probably the lynchpin of the show is Gogan’s delivery style – the facial expressions, the rhythm and pace, the lingering on key phrases from the book (e.g., “scrotum-tightening sea”) that are pregnant with humor and with deeper meaning at the same time. Part of the story’s pace is driven by the erratic transitions (“ok, let’s get back to…”; “anyway…”). This is no oversight but a reminder that perfect continuity was never the point in Joyce’s writing. Gogan teases us into enjoying the associative flow without getting anxious about “losing the thread.” That, indeed, might be the best learned secret to enjoying Joyce’s longer works. If any improvement could be made, Gogan could perhaps use props and dynamic movement to better distinguish the characters. One could picture a bit more color and prancing about. The second act is more polished in this regard, especially in the excellent segments on Gerty and Molly. Gogan’s epilogue of contemporary criticism fit well and could even be extended a bit for my taste. But as I press to think of how to pull out more potential, even that pressure is a sign of the show’s strength. As in Ulysses itself, part of the richness lies in the sense that there are always, no matter how many readings you give, more hidden opportunities to be dug out of the text. Review of San Fran ‘60s, M. W. Jacobs. Escallonia Press, 2017. If you want an insider, Gonzo-style, journalistic account of daily life in late ‘60s Haight-Ashbury, this is your book. Jacobs gives a series of varied-length vignettes moving back and forth across time, as our personal memory moves back and forth across time, from the early 60s to the 80s, from San Francisco to a cabin and milk truck proto-commune in the Mendocino forests, with forays to Mexico and New York. But the keynote keeps coming back to 1967, the Summer of Love in the Upper Haight. Some might wish for more pop and drama, or maybe a more well-wrought plot to sustain a rollicking ride. I myself was looking for a bit more development of the ideals that we all associate with the hippies. These stories can get a little dark after 150 pages. But perhaps this is all personal preference. What Jacobs does he does well, and that is to give an unromanticized, street-level account of the male hippie’s daily hunt (in both its comical and disturbing aspects) for chicks and drugs and ways to beat the draft. We do get some dramatic tension with recurring mini-plots that thread through multiple stories – the “speed disaster,” Bernie’s big secret – but many of the tales are uneventful, in the way that the stories in James Joyce’s Dubliners are uneventful, giving no payoff but leaving you at a point that’s poised between potential and kinetic energy. If Jacobs’s plot lines don’t keep you on the edge of your sit, though, his prose style always engages. His wit can be purely humorous, as with the “plump, middle-aged straight lady” who works the sidewalk grill and is presently “expounding, spatula in hand, on what was thrown off Tallahatchie bridge in the lyrics of an AM radio hit” (“The Street”). Or it can be disquieting, as when he describes driving high in the fog: “It was Russian roulette and every car that didn’t hit us was an empty chamber” (“Gilroy”). This latter expression too is humorous, no doubt, but it is the humor of Hunter Thompson’s Fear and Loathing in Las Vegas, a belly laugh laced with the idea that this could turn very serious any moment. The parade of momentary but sharply sketched characters is also memorable – the speed freak who’s “a walking filibuster” (“Amateur Insanity”), or Cappy, “a gifted storyteller” who was “short, skinny, and hunched, with a spoon-shaped torso” (“Junkie Love”), or Dan, “who no more believed in God than a man believes in the train that has run over him” (“There Is Only One Misfortune”), or the various “couch nomads” and communist “connoisseurs of outrage” to be found in this “colony of rejects” (“Summer of ‘66”). The characters sometimes come and go too quickly, but the narrator’s observation of them is packed with emotional and psychological nuance. Even his own “frenzied self-analysis” (“Gilroy”) may not be healthy, but it brings us closer to him. The book’s strengths are in the vivid, grounded sense of time and place, in the parade of quirky but real characters, and in the play of the language when Jacobs works it. Plot and theme seem a little uneven, and as I think back on what I enjoyed most about the book, they do not rise to the top. In my opinion, though, the tradeoff is worth it, as we get a sense of journalistic, unembellished life in the Haight – and beyond the Haight as we come to identify with our narrator in general, to feel his emotional life as his memory moves poignantly back and forth, from the primeval forest moments with Yvette in the ‘70s, then back to ’67, then up to the 1980s, recounting personal loves and losses as he ponders his luck at catching cultural history at just the right time and place. I pulled two cards from the top of the deck and studied them. Far away, goats’ bells ding, and still further out, glimpsed between the gnarled crosses of olive trees tumbling down the rugged hillside, lies the expansive, dark blue Mediterranean. Two white chickens, boisterous, nearer to the scene, patrol Spiro’s patio. Unripe grapes hang, lemony waxen bath beads, above our heads. Time passes. Giovanni deals the cards, suffers a poor draw. One must not forget: the sun is to be worshipped here. We fill an empty bottle with local wine, swim, and prostrate ourselves before said deity, naked like stones in the sand. A hoary old Greek raises a piece of driftwood shaped like the arm of Achilles and heaves it with great show of violence into the sea; he stares straight at me with a look of wild relief, laughs, spits, and disappears down the east beach. I jump when awakened. It is one of my traits. This time, I am awakened at Lake Travis, Austin. Years seem to have passed. Jane is naked, shorter than average but perfect in form, waist deep in water. The tips of her hair, long, brown, silky, dip the water. Her solid brown eyes, soft but alert to every modulation in the visual universe, observe, assess, and disregard two kids wading toward her. I lay back and close my eyes at the sun, as Jeff sits up and says something about chili rellenos. I hear the kids shriek and plunge. A stout woman screams something in Spanish. I open my eyes. The beach is deserted save for them and us. We find Katie and Alissa, her four year old, in the front yard studying a caterpillar. Alissa has Katie’s narrow chin and high cheekbones. One can already see her life unfolding through the features. The caterpillar reminds Jeff of a story. Once he had waited for months for a cocoon to open. He had pictured the fuzzball breaking open like a pomegranate. But eventually he forgot about it. Then one day he was playing in the yard and heard a little scratching sound. He turned and saw the cocoon just beginning to tear. And do you know what came out of that cocoon? We load Katie’s boxes and take her mattress to the dump. We do not notice the city’s mysteries along the way because Jane and Katie and I are together, and are absorbed in each other’s radiance, so to speak. In a way, I suppose, we are all in love. The dump is a mess with its own incalculable aesthetic. Dump trucks fly past, magical beasts from an unwritten landfill fairy tale. We wave. We are high at the dump. Jesus. Now we have five residents in our household. Jeff is the most observant. Jane is the most beautiful. Katie is the most fun (but tragically not so on the day of our story). Alissa is the youngest. And they say, perhaps jokingly, that I am the philosopher. Perhaps we are not all in love. Perhaps I am oversimplifying. I say this because of what I saw at Bartholomew Park. The joggers, thin, fashionable, or flabby, loped past. At the center of the park is a playground. There is one child in the playground. She pops a yellow, curly-topped head out from under a slide, pokes a stick in the sand. One of the joggers, a woman, perhaps in her late 20s, has stopped near a trash barrel. Her gym shorts sport a High School logo no longer legible and an animal face about the size of a walnut. Several Coke cans and the meat of a fruit lay around the barrel. The jogger near the barrel is Jane. She is breathing heavily. No, she is weeping. The child is studying something dark that she holds in her hands. It begins to rain. I will not see Jane again.